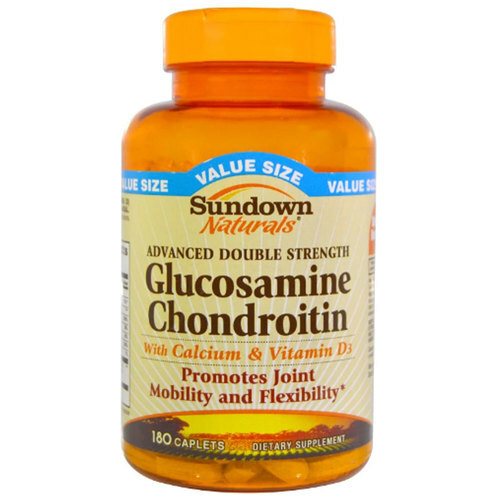 Double Strength Glucosamine Chondroitin from Sundown Naturals contains a blend of three different types of shellfish. 警告: Contains shellfish (shrimp, crab, lobster, crayfish) ingredients. If you are pregnant, nursing or taking any medications, consult your doctor before use. Discontinue use and consult your doctor if any adverse reactions occur. Keep out of reach of children. Store in a dry place and avoid excessive heat. Tamper resistant: do not use if seal under cap is broken or missing. 注意事项: No artificial flavor or sweetener, no preservatives, no sugar, no milk, no lactose, no soy, no gluten, no wheat, no yeast. 推荐用法: For adults, take three (3) caplets daily, preferably with a meal. As a reminder, discuss the supplements and medications you take with your health care providers.